Ever since the great Maps debacle of iOS 6, Apple has been trying to gain lost ground to the competitors it suggested against its own native app. But can transit directions and indoor mapping be enough? The WWDC keynote on Monday included a very significant update to Apple’s Maps app in iOS 9: mass transit directions. Starting this fall, we’ll be able to use Maps to figure out a route to our destination that includes buses, subways, trains, even ferries. And it’s been a long time coming. Since 2012—when Google Maps was kicked to the curb in iOS 6—Apple Maps has had a tab suggesting third-party apps (like Google Maps...) to get public transportation routes. 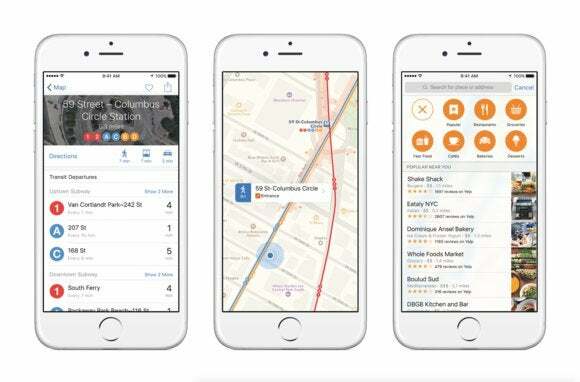 The transit update in iOS 9 marks an important step for Apple and its Maps service not having to rely on third parties to provide such a core smartphone functionality. It took them three years. You’d think that after all this time Maps would have an expansive network of public transportation schedules and routes, but this feature is only available in select cities, including just 10 in North America and Europe. It’s not shocking that Apple is taking its sweet time in creating a competitive Maps app. Cupertino is not fond of speed as much as precision. Apple says that Maps will one day be so accurate, it’ll tell you which subway entrance is best to take. Apple has started to send out its own fleet of vehicles to collect detailed mapping data, including Street View-style images and 3D mapping. Beyond that, Apple is also testing self-driven robots to collect indoor mapping data of big office buildings and landmarks. The first building that Apple is looking to indoor map is the company’s new spaceship-looking headquarters. Slow and steady seems to be Apple’s strategy in beefing up Maps, but features like transit directions and Street View are firmly in its competitor’s rearview mirror. Apple needs to pick it up a little or it could be left behind. 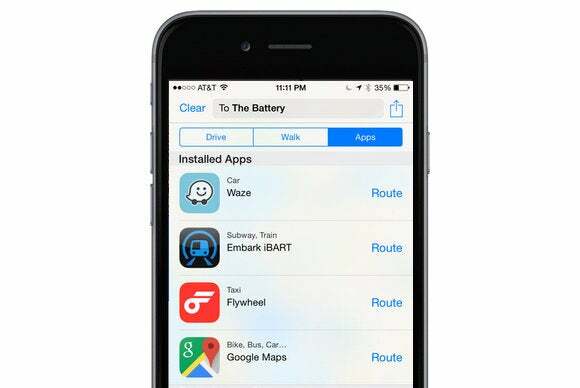 Apple Maps will stop suggesting third-party apps for transit directions. Google introduced Street View and mass transit info for iOS seven years ago in 2008. Back then Google Maps included transit directions for 100 cities worldwide. Today that number has skyrocketed to over 18,000 cities in 64 countries. While Apple is trying to bring those essential features to Maps, Google (having already done all the heavy-lifting) can focus on the low-hanging fruit. Following WWDC, Google announced that iOS users will get a Google Maps feature that has been available on Android since April: the ability to send pinned locations from your desktop to your device. Ironically, this feature is already available on Apple's Maps desktop app for OS X.
Google Maps is also slowly inching up to the more socially driven services like Yelp and Foursquare. In this new update, you’ll also be able to view your photos and reviews directly in “Your Places” profile. Google also has a secret weapon when it comes to driving directions: Waze, the app it acquired for $1 billion in 2013. Waze became a popular and widely trusted alternative in turn-to-turn navigation because it has a network of drivers reporting traffic information, accidents on the road, and other hurdles in real time. Relying on drivers who are actually on the road at any given moments makes Waze’s data extremely accurate. Waze is often better at suggesting side roads or alternate routes because it gets its directions from the routes locals take every day. The navigation app also leverages its community for other cool features, like discovering new places and finding out if gas prices are surging. This social, crowdsourced element to directions is something that privacy-focused Apple is probably not going to try to imitate. But Apple could use its fleet of camera-equipped vehicles to map out every back alley and side road to make Maps the best at suggesting alternative, traffic-free routes. Might as well. Those vehicles are already late to the game: what’s another year mapping out areas that are off the beaten path.